I think I'm satisfied with this version of my Fedora. Next comes documenting the pattern. 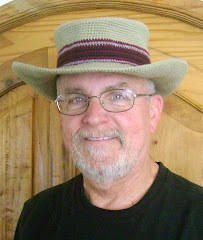 The hat band will be different (this version was done hastily so I could wear the hat to my grandson's soccer game - team colors are Maroon and White). Ha Ha Ha! You caught me. Too bad you can't edit those things. I had just looked at something right before posting about a "Ken" and that name was in my head. And just got off the phone with my brother with the same name too. I do apologize. That's what I get for multitasking. Glad you have a sense of humor! Oh, that's OK. No offense taken. Just checking in on everyone for delurking week and leaving notes. I was lucky to have this color (Country Rose) it matches the team colors very well, I think. Excellent stuff...you have a hand with it.Will wait for the tutorial...the color also is chosen very well for every project.Do give some options and discussion about colors in the tutorial. My color choices are generally dictated by the yarn I have in my stash at the time, or sometimes, just what's within reach. Thank you so much for joining in to follow me. I wrote about you in one of my posts and also added you blog address. Come visit again soon.